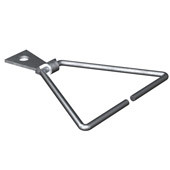 The 315-BT is fitted with a Vee Byna- Tie®for use with the Seismiclip® Interlock System. For use with 305 Dovetail Slot. 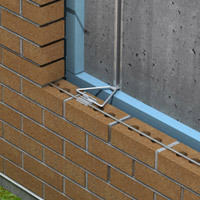 Horizontal joint reinforcing wire and Vee Byna- Tie® are snapped into Seismiclip and covered with mortar. 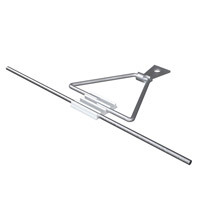 This allows wire, tie and anchor to function as a single unit attached to the backup. 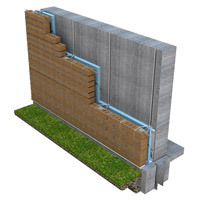 Continuous wire is beneficial for seismic zones or to provide additional protection against problems arising from thermal expansion and contraction. The continuous wire also allows for a more uniform distribution of lateral forces. Standard dovetail head is 12 ga. thick x 1" wide. 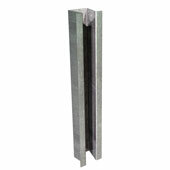 Standard Vee Byna-Tie® available 3/16" dia. x 2- 1/2" thru 9" long. 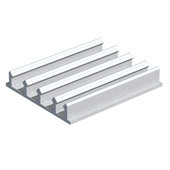 Other lengths or 1/4" dia. available on special order.